A strong community where all belong and thrive. To support our diverse community to achieve its goals, and to enhance the strength and resilience of our neighbourhoods. 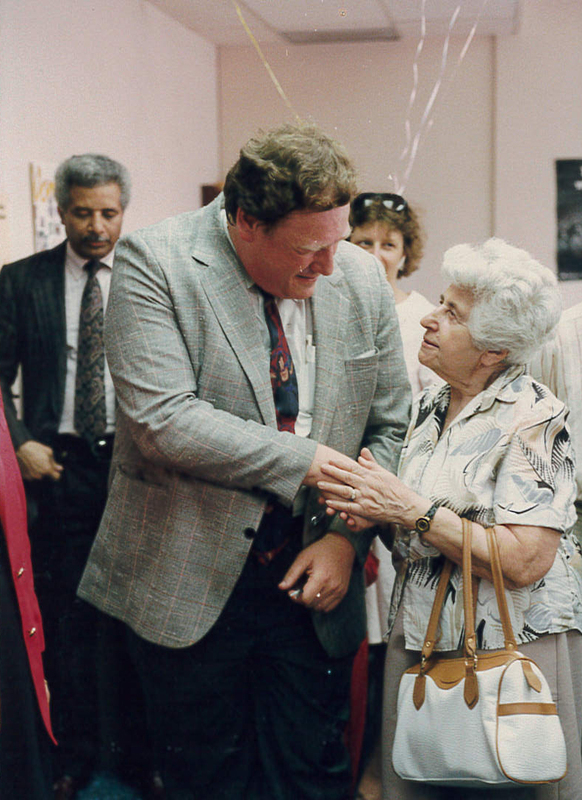 In 1990, North York Community House (‘NYCH’) came into existence as a result of a sizable donation from an anonymous benefactor. Over the course of 25 years, this single act of generosity grew into an organization dedicated to assisting newcomers to Toronto in settling and integrating into their community, and to building strong neighbourhoods. 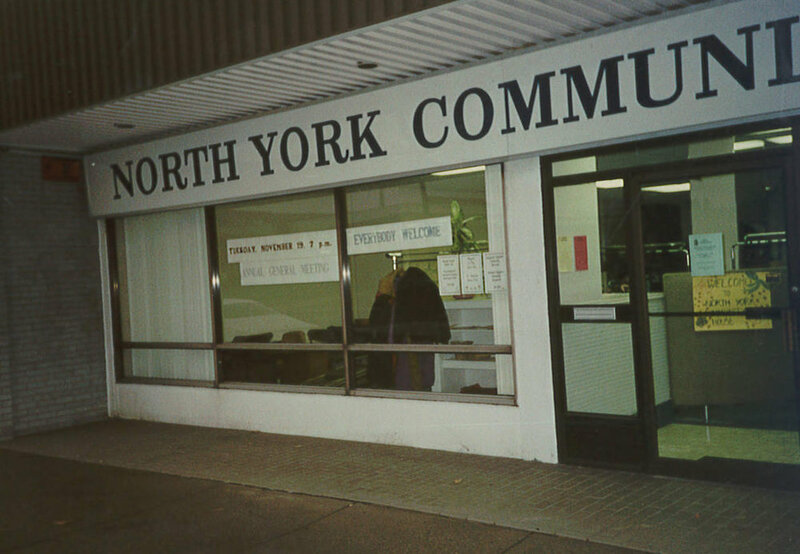 When NYCH’s doors first opened, it operated out of a tiny Bathurst Street storefront with a staff of two. As the community changed, NYCH kept pace. In the intervening years, NYCH has grown, moving into several locations and expanding its services. Today, a staff of over 100 conducts services in 50 locations to over 25,000 individuals annually. A few things at NYCH have remained unchanged, things like our commitment to working with individuals in an effort to strengthen communities. Imagine, all this from a single, anonymous donation. Metro Councillor for North York-Spadina, Howard Moscoe, received notice of an anonymous donation to be made to his community with the funds to be allocated to a worthwhile community project. The benefactor requested that the project be rooted in the Bathurst-Lawrence area and that the funds be used for capital expenditures. Councillor Moscoe was named to act on the donor's behalf in the determination of the community project. Metro Councillor Moscoe publicly announced an open process whereby community members had the opportunity to put forward project ideas, and make recommendations for the use of the funds. A Steering Committee comprised of three community residents and several North York community workers was named by Councillor Moscoe with the mandate to review, study, examine, and evaluate the numerous project proposals. A press conference was held announcing the joint project proposal for North York, to eventually be known as the North York Community House (NYCH). North York Inter-Agency and Community Council was awarded $900,000.00 from the anonymous donor to be held in trust until such time as the NYCH established itself with a Board of Directors, incorporation status, and charitable status. A Steering Committee was organized to direct the establishment of the settlement house. The Steering Committee worked to develop objects of incorporation, goals and objectives for the future community house, a mission statement, policies, a constitution and bylaws, and membership criteria. The existing Steering Committee, with additional members, became NYCH's first Board of Directors and officers were elected. A location was secured in the Bathurst-Lawrence core of North York, as requested by the benefactor. NYCH hired two staff persons and opened its doors at 3101 Bathurst Street. A comprehensive needs assessment of southwest North York was conducted. Based on the results of the needs assessments, programs were developed for older adults and domestic workers. NYCH established English as a Second Language Program with classes in the Bathurst/Lawrence and Trethewey communities. The first Annual General Meeting was held, electing a 12 person Board of Directors. English as a Second Language Classes were expanded to the Lotherton community. The senior’s program was expanded to include a wider variety of activities. Programs to serve the Tamil, Vietnamese and Spanish-speaking communities were developed. The community space at 505 Lawrence was leased for seniors programming. Community offices were opened in Joyce Public School and Trethewey. NYCH became a United Way member. NYCH, in collaboration with other organizations serving newcomers, co-ordinated seventeen settlement workshops for Vietnamese, Chinese, Tamil and Spanish-speaking newcomers. “The House Special”, North York Community House’s own newsletter was initiated. North York Community House moved its main site from Bathurst and Lawrence to larger premises at 1200 Lawrence West (Lawrence and Caledonia). North York Community House passed a comprehensive Anti-Discrimination Policy and Procedures. North York Community House developed a new vision and set of program priorities and, as a result, developed new programs and services including a resource centre and after-school tutoring program for children. North York Community House provided leadership to develop and obtain funding for an innovative partnership model to provide tutoring and settlement services to the Latin American community in southwest North York. Through funding provided by the Ministry of Citizenship, Culture & Recreation, NYCH expanded its settlement services to the Tamil community. NYCH received funding from United Way to further develop its programs for children aged 0-6 and their parents. A parent child drop-in program was developed. Through funding from Citizenship and Immigration Canada, NYCH played a leadership role in the Settlement and Education Project in Toronto (SEPT) and provided settlement services to newcomers in 7 schools. NYCH provided 5 English classes at a variety of different levels. NYCH further expanded its children’s and family programs to include a wide range of programs for children and their families. 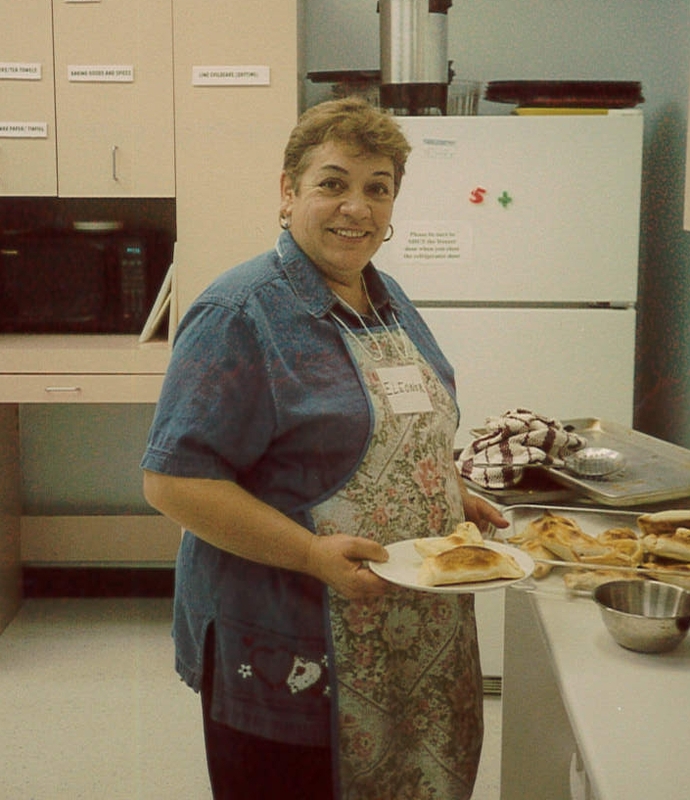 Through funding from United Way, NYCH instituted community kitchen groups to help newcomer women settle. NYCH celebrated its 10th Anniversary at its Annual General Meeting in June. NYCH moved to its current location at Lawrence Square Mall at Lawrence Ave. and the Allen Expressway. NYCH continued to expand its children’s and family programs to provide March break and full-time summer programs for newcomer parents. NYCH initiated the Newcomer Connection Program, a pilot project which trains immigrant women to reach out to newcomer families. With funding from the Trillium Foundation and the City of Toronto, NYCH expanded its women’s programs to provide a variety of women’s groups and further develop the Newcomer Connection program. NYCH initiated a partnership project with organizations and residents to develop and carry out programs for children, youth and women in the Trethewey and Martha Eatonway neighbourhoods. This project received 3 year funding from the United Way of Greater Toronto, as part of their Strong Neighbourhoods, Healthy City strategy. Through a partnership between Macaulay Child Development Centre and the Early Years Centres, NYCH opened three new early years’ programs for parents and their children aged 0-6. In 2004 NYCH’s settlement program in the schools (SEPT) program expanded to serve schools in the Rexdale community and to offer settlement workers in 25 different schools. NYCH’s women’s programs and family program expanded to provide programs in additional languages and in new neighbourhoods. The Community on the Move partnership project in Trethewey community is having a major impact on the community. With funding from United Way and a partnership between agencies and community residents, a variety of exciting children’s, youth and women’s programs are being offered. NYCH’s Newcomer Connection program was chosen by the Toronto Community Foundation as a Vital Idea and awarded a grant. NYCH’s women’s and family programs provided new programs for the Vietnamese and Somali communities. NYCH’s Community on the Move partnership project in the Trethewey community expanded to include the Success in Schools project, which helps young people succeed in high school and plan for their future. NYCH launched the Newcomer Connection film, which tells the story of the experience of three Newcomer Connection participants. With ongoing funding from United Way, the Newcomer Connection program expanded its training. NYCH piloted the Get Moving! Program to support newcomer women and their families to become more involved in healthy physical activities. NYCH community kitchen programs expanded to include more groups focused on food security issues. NYCH was selected by United Way to initiate the Action for Neighbourhood Change (ANC) project. This project provides intensive community development support on the Lotherton/Caledonia neighbourhood. NYCH’s SEPT program expanded to include 38 schools. The new Library Settlement program was initiated at Yorkwoods library. NYCH partnered with two other North York organizations to expand our community development activities and integrate community development across NYCH. NYCH’s Newcomer Connection program is awarded the Ontario Trillium Foundation’s 25th Anniversary award. Additional activities and initiatives were begun in Lotherton, including the new Lotherton summer camp. The Get Moving! Program was expanded to provide a wider range of activities and serve more adults and children through a three year grant from the Ontario Trillium Foundation. NYCH received additional funding from Citizenship and Immigration Canada to implement the new Host and the Youth Mobile Settlement programs. Action for Neighbourhood Change moved into its community offices in the heart of the Lotherton community. NYCH’s digital storytelling program began with the training of the settlement in the schools workers. A new community and leadership engagement training program was implemented. The NOW (Newcomer Orientation Week) program began in four SEPT schools to introduce newcomer students to Toronto’s high schools. In developing its strategic plan, NYCH held over 30 focus groups with community members, program participants and staff. Get Moving! After-school programs began in three neighbourhoods. The Digital Storytelling project was piloted at Kipling Collegiate Institute. NYCH moved into the Jane Street hub as an anchor tenant and began to develop women’s programs for the community. Youth programs in Trethewey wound down. NYCH began its new 5-year strategic plan. The digital storytelling program was expanding to include additional locations. A business plan for a catering social purpose enterprise was developed and Delightfully Yours catering began. A new program model was developed for the SEPT program in order to serve more newcomers and more schools. The financial literacy program for women and youth began. A new communications plan, including the use of social media, was developed. NYCH’s first fundraising benefit, “Journeys of New Canadians” was held at the Shamba space and raised $16,000. Delightfully Yours Catering was awarded the Toronto Enterprise Fund business plan award for 2012 and the Culinary Employment Training program began. The Lotherton community continued its revitalization through Action for Neighbourhood Change with several new initiatives including the Village Bloggurls and Girls' Mentoring program, the launch of the new basketball court, and the Family Fruit Tree project. Lotherton’s community garden and fruit tree project is a finalist for a City of Toronto Live Green award. NYCH moved into the Bathurst-Finch Hub as anchoring partner and expanded its services in the Bathurst Finch community. NYCH’s Welcome to the Circle anti-violence program in Lawrence Heights was awarded the Mayor’s Community Safety award. NYCH partnered with a group of volunteers to initiate ShareThanksgiving. NYCH released its report “DIY: Immigrant Entrepreneurs are Doing it for Themselves” report which was a result of a year of participatory research with immigrant entrepreneurs and community organizations. The Stepping Stones to Leadership program to support and mentor newcomer volunteers began operation. Action for Neighbourhood Change is awarded the North York Urban Heroes Award in community. NYCH led the initiation of the Toronto Settlement Collaborative to identify and pilot new models to serve newcomers. NYCH participated in the Resiliency Pilot project to build resiliency in organizations serving newcomers. NYCH celebrated its 25th Anniversary, looking forward to many more years in the community. NYCH developed a new strategic plan, building on the Theory of Change which focuses its work in the three progressive impact areas of Settle, Thrive and Lead. Staff participated in the development of action plans for NYCH’s key program areas (including youth, settlement, language, community development and healthy living, among others). With the arrival of families affected by the crisis in Syria, NYCH hired Settlement Workers to provide support specific to the Syrian community. These staff members were able to meet with clients across several different locations, helping them through the unique challenges involved in starting a new life in Canada. and supporting senior caregivers who are at high risk for social isolation due to language and cultural barriers. NYCH integrated financial coaching (which helps people to change their behaviour around finances) into existing settlement services - with significant support from Prosper Canada.